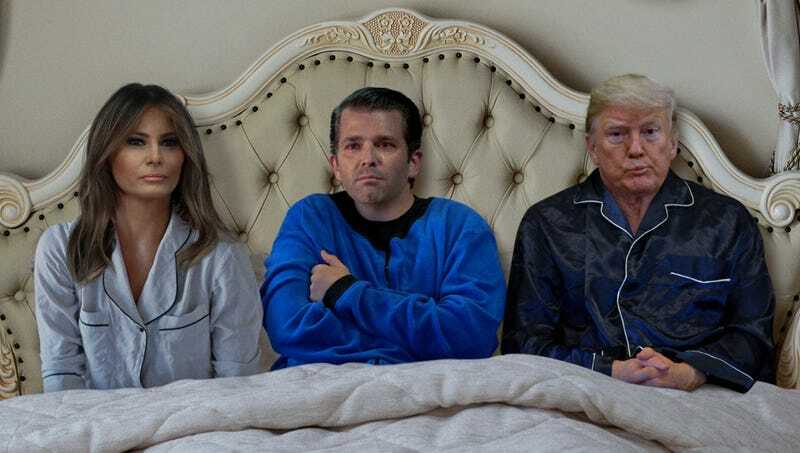 WASHINGTON—Sobbing uncontrollably as he ran into the room, Donald Trump Jr. asked his father, the 45th president of the United States, if he could sleep in his bed with him Thursday night after reportedly having a bad dream about being indicted. “It was so scary! The bad man told me that telling lies to Congress and asking for stuff from foreign nationals were big crimes and that I had to be at court in 30 days,” whimpered a terrified Trump Jr. while climbing under the covers with his favorite stuffed animal so he could hide from “the mean and evil special probscooter [sic].” “It felt so real, Dad. I want to stay here with you. You’re going to protect me and make sure he doesn’t get me, right, Dad? He said he had enough proof to send me away to jail for a long, long time. And that you wouldn’t even try and pardon me.” At press time, the president was heard yelling obscenities after he awoke to discover his eldest son had wet the bed.